Merchant banker is an institution which carries out a range of services related with securities after obtaining license from concerned authorities. As defined in Section 2 (gha) of Merchant Banker Regulation 2064 (amended 2074), Merchant banker refers to the securities businessperson licensed to carry out one or more activities mentioned in Rule 16. The activities mentioned in Rule 16 are: activities related to securities issuance and issue management, underwriting, Registrar to shares, portfolio managementand corporate advisory. Thus, merchant banker is an institution, licensed by Securities Board of Nepal (SEBON) to provide various types of services related to securities. Mutual fund refers to the collective investment which pools money from the investors and invests such money in various kinds of securities and investments. The company that manages such fund is termed as the fund manager. In Nepal, "A” class commercial banks started sponsoring the mutual funds after enactment of Mutual Fund Regulation in 2067. In practice, a commercial bank establishes a fund management company for the operation of mutual fund schemes. The fund management company manages the investment of mutual fund and makes investment decisions in accordance with the scheme objectives. Generally, the company which manages the mutual fund also takes license to act as merchant banker. For example, ABC Capital Limited manages the mutual fund sponsored by ABC Bank Limited. It may also take license from SEBON to act as merchant banker. Value Added Tax Act 2052 has stated in Section 5 that the supply, import and export of goods and services, other than the items enlisted in Schedule 1, are VAT attractive. As per Group 11 (II) of Schedule 1 of VAT Act, among others, capital market business, securities business, merchant banking business, commodity future market, securities and commodity broker business are exempt from VAT. This provision has been inserted by Finance Ordinance 2075. Before Finance Ordinance 2075, the Group 11 (II) of Schedule 1 of VAT Act included, among others, “financial service” as exempt from VAT. The services provided by merchant bankers were considered as financial services, and thus treated as VAT-exempt services. Before Finance Ordinance 2075, there was dispute regarding the tax rate for merchant bankers. The merchant bankers had been assessing income tax at corporate rate of 25%. Before Finance Ordinance 2075, Section 2 (1) and (2) of Schedule 1 of Income Tax Act 2058 had stated that the tax rate for entities shall be 25% except, among others, to the banks and to financial institutions. The merchant bankers are licensed from SEBON to carry out various merchant banking activities. They do not have to obtain permission or license from Nepal Rastra Bank (NRB) to carry out its transactions. They do not fall under the definition of banks or financial institutions under prevailing laws. Therefore, their argument was that they are not required to pay tax @ 30%. However, some scholars argued that that merchant bankers should deposit tax @ 30% as it is not legally justified to enjoy double benefits by not getting registered in VAT (being financial service provider) as well as not paying tax @ 30% (not being a financial institution). Finance Ordinance 2075 has clarified this dispute by amending the provision in Section 2 (2) of Schedule 1 of Income Tax Act 2058. It has stated the tax rate of 30%, among others, to the capital market business, securities business, merchant banking business, commodity future market, and securities and commodity broker business. As per Sub-section (1) of Section 88, tax @ 15% shall be withheld on payment of various enlisted items. However, as per Restrictive Clause (6) in the same sub-section, tax @ 5% shall be withheld on distribution of return by a Mutual Fund to a natural person. Thus, it can be interpreted that TDS @ 5% is to be deducted by the Mutual Fund on distribution of return to a natural person. Since the restrictive clause has been inserted after the sub-section, it is understood that TDS @ 15% is to be deducted on distribution to others. As per Section 88 (4) (Nga), [Sec 88 (4) (Chha) in Finance Ordinance 2070], Section 88 shall not be applicable in case of payment of dividend and interest to a Mutual Fund. Thus, when the Mutual Fund is receiving any dividend or interest, then the payer should not deduct any TDS on such payment. The Mutual Fund receives the gross amount. In practice, frequent cases are seen where the bank mistakenly deducts TDS while crediting interest in the bank accounts of Mutual Fund. In such cases, the Fund has to claim any amount so deducted after due reconciliation. As per Section 92 (1) (Nya), the distribution of return by a Mutual Fund to a natural person shall be deemed as final withholding payment. Thus, the natural person receiving the return shall not have to assess further tax on return received from mutual fund. Such amount is final taxed in the hand of receiver. As per Section 88(1), the rate is 5% as discussed above. Hence, such income of natural person is taxed @ 5% only. However, in case of entities, although the tax @ 15% is withheld on payment, they have to assess the tax based on their corporate rate, the withholding not being final. As per Section 95Ka (4): [Sec 95Ka (2) in Finance Ordinance 2070], Advance tax shall not be levied in case of disposal of investment made by Mutual Fund. Thus, when a mutual Fund incurs capital gain on disposal of securities, the broker does not deduct any tax on disposal proceeds. As per Restrictive Clause (3) in Section 1 (4) of Schedule 1 of Income Tax Act 2058, Tax @ 7.5%  is levied on gain from disposal of securities listed in SEBON, in case of a resident natural person. 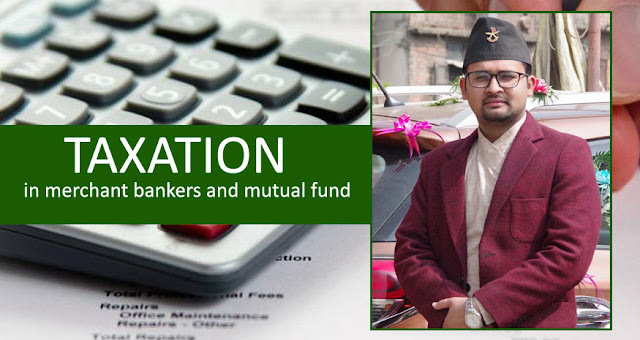 Hence, the capital gain tax on disposal of mutual fund units by the unit holder (natural person) is 7.5% as the mutual funds in Nepal are required to be listed. Such tax is deducted as advance tax. Since the rate prescribed by Schedule 1 is also 7.5%, no further tax has to be deposited by the person. As per Section 95Ka (2) of Income Tax Act 2058, the rate for capital gain from disposal of listed stock is 10% and for unlisted stocks is 15% in case of resident entity. Hence, the capital gain tax on disposal of mutual fund units by the unit holder (entity) is 10% as the mutual funds in Nepal are required to be listed. Such tax is deducted as advance tax. Since it is not final withholding tax, the entity has to assess the tax based on their corporate rate. In case of regular sale, the capital gain is calculated by the brokers on sales value less cost price. The net amount, if positive (i.e. gain), is taxed @ 7.5% for individuals, 10% for entities and no tax for mutual funds, as discussed earlier. The close ended mutual funds have a fixed maturity period; say 5 years or 10 years. At the end of the period, the unit holders are distributed the amount calculated in accordance with the net asset value (NAV) on the maturity date. For example, if a person has purchased 100 units @ Rs. 10 at Day 1, and if the NAV per unit is Rs. 16 at the maturity, then he shall be refunded with the redemption value of units held by him, i.e. Rs. 1,600. In such case, there may arise some capital gain. The treatment of capital gain is same as in normal sale. The capital gain is calculated on redemption value less cost price. The net amount, if positive (i.e. gain), is taxed @ 7.5% for individuals, 10% for entities and no tax for mutual funds as discussed earlier. Mr. A applied for 2000 units in ABC Mutual Fund Scheme at New Fund Offer (NFO), where he was allotted at full. He further purchased 3000 units from secondary market at Rs. 12.80 per unit. As on maturity date, his holding is 5000 units. The weighted average cost per unit comes to Rs. 11.68 (i.e. [2000 x 10 + 3000 x 12.80] / 5000). Suppose the redemption value of the scheme at the maturity comes to Rs. 16 per unit. Hence, the capital gain is Rs. 4.32 per unit, or Rs. 21,600 in total. Since Mr. A is a natural person, advance tax @ 7.5% is deducted on such capital gain. As we discussed earlier, the distribution of dividend (termed as Return) by a Mutual Fund is taxable. The rate for the same is 5% for natural person, 15% for others, and no deduction if the unit holder is another Mutual Fund in line with Section 88 and Section 95Ka of Income Tax Act 2058. However, the treatment of dividend can be interpreted from another angle as well. Another school of thought says that the treatment of distribution of dividend by a mutual fund should be same as the distribution by a company. This logic views Section 88 as the section merely for withholding purpose; the charging section for treatment of dividend being Section 54. As per Section 54 of Income Tax Act 2058, the tax on distribution of dividend by company to its shareholders shall be final. Section 88 (2) (Ka) states that the TDS on dividend shall be 5% of the payment amount. If we look at the definition of “company” in Section 2 (Da), it includes the term “unit trust” under the definition of a company. Section 2 (Tra) defines “unit trust” as a trust with the provision that the assets are held by a trustee for the benefit of at least 20 persons, and to divide the right of persons to participate in the income or capital by the number of units held by them. Thus, if mutual fund is to be considered as unit trust (and hence, the company); then the distribution of dividend by Fund shall be taxed @ 5% Final for all (whether natural person or entity, except Mutual Fund). However, if we look at Section 88 carefully, there is provision regarding the distribution by mutual fund in sub-section (1) of Section 88. Similarly, there is also provision regarding the payment of dividend in sub-section (2) of the same section. Hence, it can be interpreted that the distribution by Mutual Fund is governed by Section 88 (1); and in case of payment of dividend by others, Section 88(2) is to be considered. Finance Ordinance 2070 had inserted the provisions for mutual fund is four different areas throughout the Act. However, it did not include the term "mutual fund" in any definition under Section 2. If the theme of the Ordinance was to denote mutual fund as "unit trust", it could have inserted the term mutual fund in its definition while inserting new provisions for mutual fund. However, the Act is silent about the definition of mutual fund. Looking at these facts and interpretations, the treatment of mutual fund as a company is not clearly justified. Hence, there is a reasonable doubt in deduction of 5% TDS on distributions by Mutual Fund. In practice, the Mutual Fund schemes have been deducting 5% TDS for natural persons and 15% TDS for entities (except Mutual Fund). The Fund managing company manages the Mutual Fund. The Mutual Funds have separate legal status from the Fund Manager. So, the Fund and fund manager are separate entities. Mutual Funds are not registered in tax and hence do not have a Permanent Account Number (PAN). But, they have to deduct TDS on payment of various types of services. Such TDS deducted by the Fund is deposited by the Fund Managing Company on behalf of the Fund..
 Registrar to Shares offers a range of services such as maintaining and updating shareholder register, share split, pledge, ownership transfer, as well as payment of dividend to shareholders. Portfolio management is a customized investment service by professionals on behalf of the client to help them diversify their investment based on risk-return appetite. Corporate advisory services include valuation, assets management, loan syndication, venture capital, etc. As per Section 2 (wa) of Income Tax Act 2058, "Natural person" refers to an individual or sole proprietorship firm or couple opted under Section 50. Before Finance Bill 2075, the rate was 5%. Before Finance Bill 2075, the rate was 5% for listed stocks and 10% for unlisted stocks. Currently only close ended mutual fund schemes are in operation in Nepal. A close ended scheme is the scheme having pre-specified maturity period.